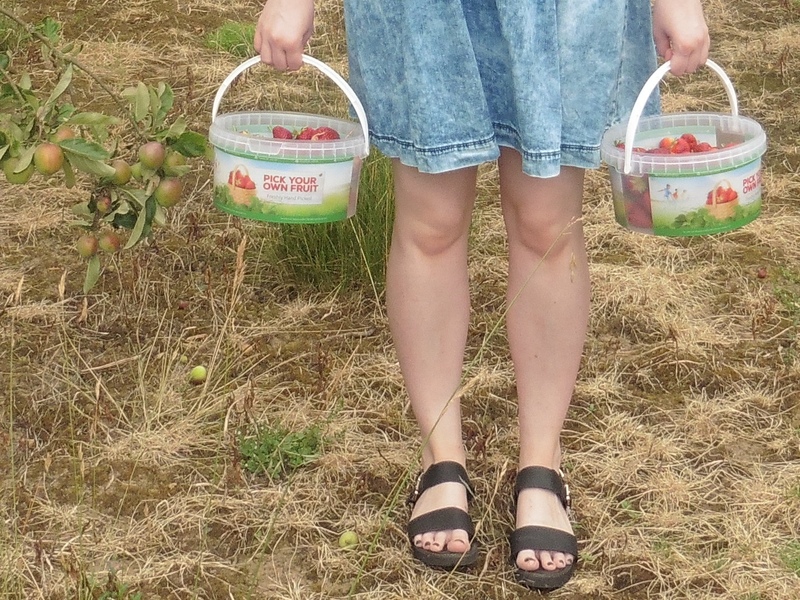 The perfect way to spend a Summer's day with family; fruit picking in the British countryside. Lucky for us, the weather was on side and the sun was shining so me and Elodie were able to rock our denim dresses and bare legs to the best of our ability while wandering the fields picking raspberries, strawberries and blackcurrants. We visited FW Elgey near Darlington, a farm which harvests not only fresh fruit, but vegetables too which change week to week and season to season. Unfortunately we had missed out on gooseberries, potatoes and peas but there were still plenty of wonderful fruits to find. Upon arrival you help yourself to some punnets to collect the fruit and follow the signs to the area you wish to visit. Each crop is spread out around the farmland, so even when it's busy you don't really notice the other families or people around you. Fruit picking is something my boyfriend has spoken about over and over again for years, something we have always planned to do together but never gotten around to. It's also something I really wanted Elodie to experience as a young child, as I had never done it before, and there's something a little magical, a little bit special about it, especially through the eyes of a child. Our first stop was to the raspberry field, which consisted of rows and rows of plants which stood taller than I do! I was a little worried that we had left it too late in the season and that we would have missed out on the best pickings, but I was wrong. It was so much fun searching through the plants and finding the brightest and biggest fruits to pick, there were literally hundreds and thousands of raspberries to be had. After picking the raspberries we had a wander through the fields of broad beans and blackcurrants and then past the apple orchard which was just beautiful. Unfortunately the apples weren't ready to pick yet, they were all really small and only just starting to get some colour, but the trees looked beautiful. I've already made plans to return to pick some of these and to shoot another outfit in the trees, it's such a dreamy outfit shoot location! Looking back at these photos I'm really regretting not picking any blackcurrants (apart from the few I ate!)... I hope they'll still be there when I go back as I'd love to bake something or make mojitos with them. Last stop was the strawberry field, rows and rows of small, leafy plants with hundreds of bright and beautiful strawberries hiding underneath. This seemed to be Elodie's favourite part of the day, she loved running around with her bucket searching for the biggest strawberries she could find... and she found some beauties. On a warm day I really can't think of a better way to spend some time... fresh air, exercise, fresh fruit and fun, I'd recommend it to any families or couples looking for something a little bit different to do. 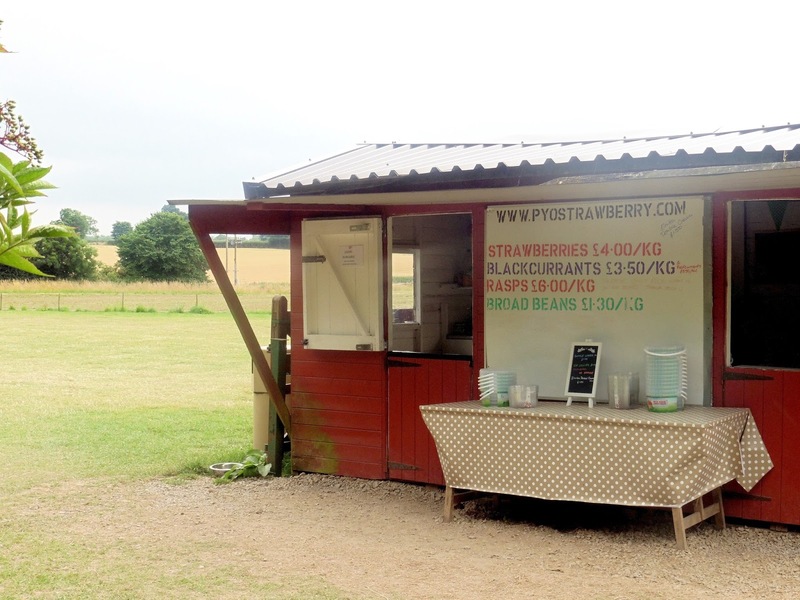 At the end we washed our hands at the outdoor tap and took our fruit back to the hut to have everything weighed.We ended up coming away with two buckets full of the freshest, sweetest strawberries and two punnets of raspberries which cost us £14. 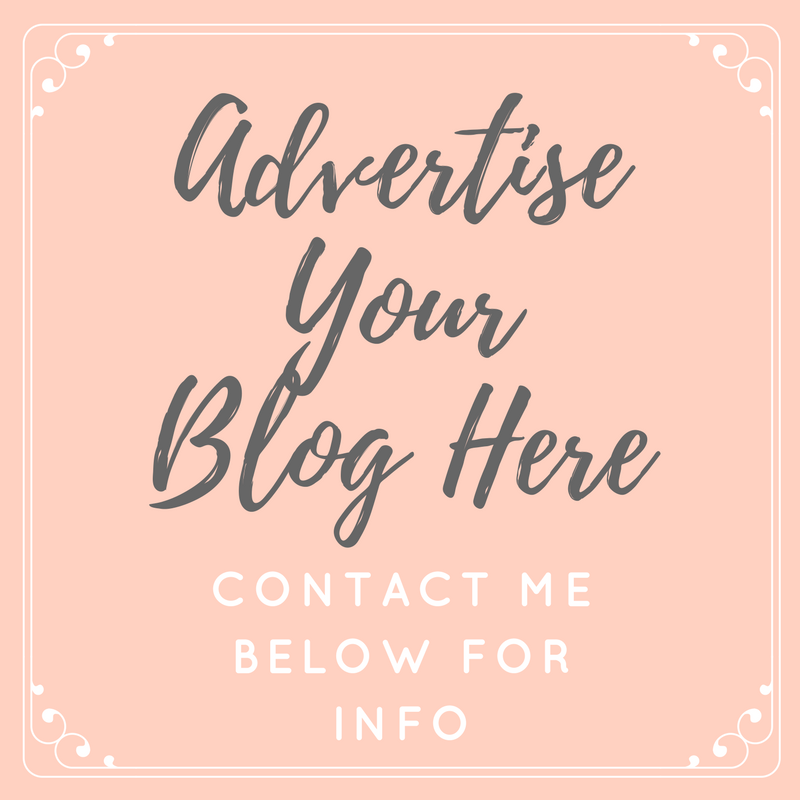 We have eaten most of the berries already already but I'm planning on using the last few to make some smoothies and some scones, although after searching Pinterest for some recipe ideas I definitely want to go and get more as I'm feeling so inspired! I couldn't resist snapping some outfit shots while we were there, like I said the apple orchard makes for such a pretty backdrop... I just wish I'd planned it and worn something newer and a little more 'fashun blogger' worthy! 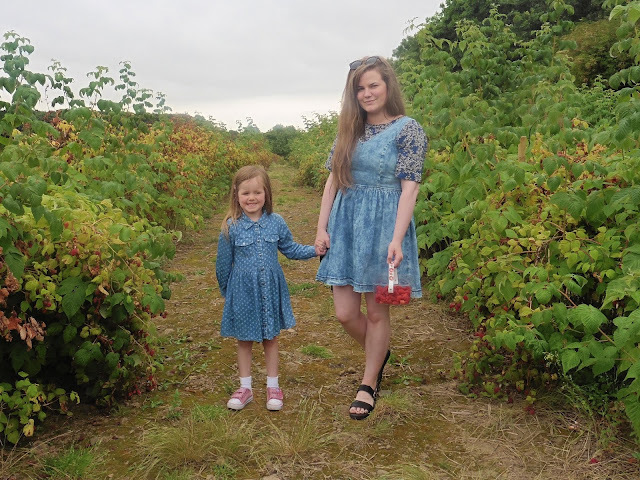 Elodie and I ended up rocking a bit of double denim between us, which as actually resulted in an unplanned but looks planned photo of the two of us which I love. The dress I'm wearing is one of my most worn ever, I love switching up what I wear underneath it be it a floral tee like in these pictures, a striped shirt, cute collared blouse or a jumper in the colder months, it feels like a new outfit every time. Elodie's is wearing a gorgeous button down floral print denim dress (which is something I would totally wear if it came in my size!) and her favourite light up trainers; seriously, can't get her out of them! 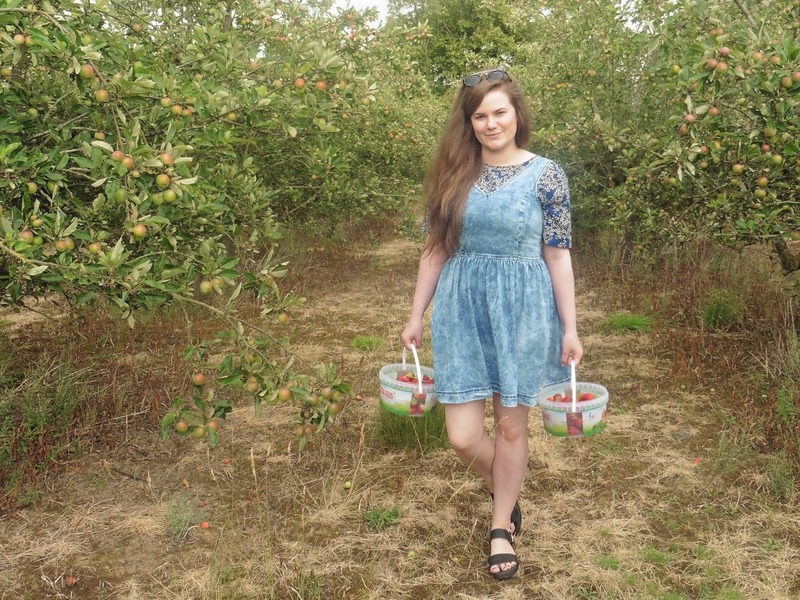 Have you been fruit picking before? Also, let me know if you'd like to see more of Elodie on here! Amazing! My friends and I have talked about going fruit picking and this just makes me want to go more. Elodie is so cute! She looks a lot like you. Fruit picking is definitely one of the special things I remember about my childhood, it's so special!